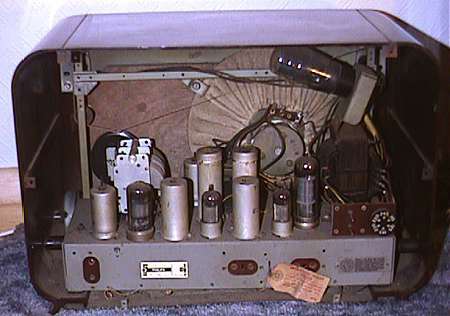 The valve line-up is consistant with the valve line-up typically used in 1948/1949 by Philips. In addition the tuning scale has the Third Program on 203.5, which makes it earlier than March 1950. Nope, but chassis looks identical to the Mullard MAS225's. In generally good condition. However one of the control dials (on/off + volume) is missing from the left hand side of the set. 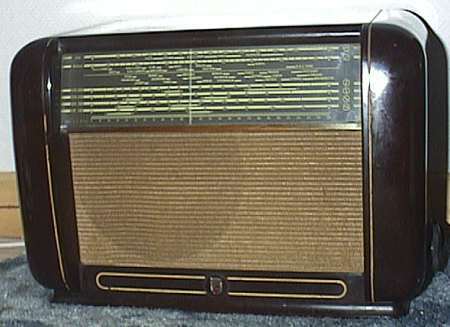 On display (just left of center) at Radiolympia (London) in 1949.